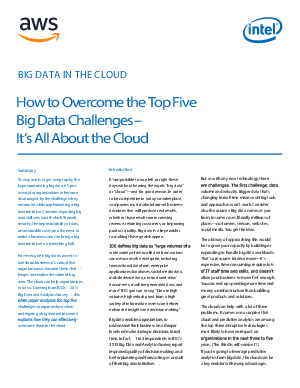 As easy as it is to get swept up by the hype surrounding big data, it’s just as easy for organizations to become discouraged by the challenges they encounter while implementing a big data initiative. Concerns regarding big data skill sets (and the lack thereof), security, the unpredictability of data, unsustainable costs, and the need to make a business case can bring a big data initiative to a screeching halt. However, given big data’s power to transform business, it’s critical that organizations overcome these challenges and realize the value of big data.